Rayford Griffin is one of those rare drummers, which are playing in all kind of genres. His collaborations are reading like a who-is-who of music industry: George Duke, Jean-Luc Ponty, Chick Corea, Dan Siegel, Stanley Clarke, Michael Jackson, Bette Midler, Anita Baker, George Howard, Patrice Rushen, Gerald Albright and many more. "Rebirth Of The Cool" is Rayford Griffin's debut album. "I didn't want to beat people over the head with an album of drum solos, odd meters and fast playing," Rayford comments. "Although I do flex some of those muscles, I wanted to be as musical as possible with something for everybody and also show how drums could be a part of that without being offensive." On a long-term basis a well reflected decision. Nothing can be as tedious as an album with the overdose of one instrument. On Rebirth Of The Cool Rayford Griffin reveals his qualities as a singer. The song is swinging and a flashback to the time, when "Bop was king and funky swing". The horn section is one of the finest: Gerald Albright (tenor sax), Brandon Fields (tenor sax) and Johnny Britt (trumpet). More superb brass is to hear on Lids And Squares: Michael "Patches" Stewart, the master of muted trumpet, Gary Bias (sax) and Reggie Young (trombone). The real drumming field for Rayford with many syncopated phrasings. Listening to the text of All That one awaits a Contemporary Urban love song. But Rayford combines elements of bop and R&B to a fascinating mélange of a new structure. So, the ones, that claim that songs with words like "baby, girl, mama" were boring and sweetish, are refuted. Jamie Glaser's warm guitar sounds and the crystallizing sounds of Deron Johnson's keyboards showcase Rayford's arrival in Smooth Jazz land on Everytime I See You. An excellent piano-solo and the mild fading out of the piece clarify true mastership. Oh, would be all Smooth jazz pieces on the music market as excellent as In Your Eyes. What an ease, what a perfection. Dwight Sills accomplishes true marvels on his guitar and Rayford is the god of drums. The next piece is called Jazzi Ray (Rayford's Song) featuring Brandon Fields on sax and Walter Fowler on trumpet. You understand the title recalling Jean-Luc Ponty's cite: "Anyone who has ever had the privilege of hearing Rayford Griffin cut loose in one of his notorious drum solos knows they are hearing state of the art percussion. But they soon discover something even more extraordinary. These are more than talking drums; they're singing. You would swear you hear a verse, a chorus, certainly there is a melody--because you follow it note for note right up to the orgasmic bridge. And here you thought you hated drum solos!" Foláke, a jazz-rock tune, showcases Karen Briggs on violin. George Duke on moog and Rayford on his drums ignite a firework. Breathtaking! Kings: On the funky side Everette Harp (tenor sax). Carl Burnett and Dwight Sills let the wah-wah sing and Ralph Rickert adds trumpet dubs. Pieces like the jazz fusion tune Coffee are a drummer's dream. Breaks, bridges, single-beat and percussion close rolls, improvisations, all of it is here. This album is not only for those which are missing real drums on other productions. Friends of Smooth Jazz, jazz fusion rock or Contemporary Jazz will find their special dainty. 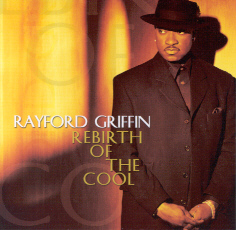 Rayford Griffin’s CD, Rebirth of The Cool (RazorEdge Records) is an inspiring musical journey of survival, perseverance and determination—it is unquestionably an inspired, cathartic "rebirth" of mind, body and spirit. One reviewer interprets the rebirth as the rebirth of the listener, writing that the music "inoculates the spirit with a baptismal sensation, and like Lazarus, we are reborn." But African-American drummer Rayford Griffin and those closest to him, know that the real rebirth here is his own physical recovery. Three and a half years ago, Rayford began a journey to break away from the "sideman" gigs. He was exploring ways to make a name as a solo artist, a leader. Five tracks for his own first recording were already in the can, and a tentative schedule to record the rest was set. No one knew just how tentative that schedule was to become…until tragedy struck. In the summer of 2000 while on tour, Rayford fell from a hotel balcony, breaking his back – and severely bruising his spirit. Awaking in a hospital emergency room with little memory of the accident, he received the news…spinal cord injury, a break near his waist between the L2 and L3 vertebrae, and compression of bone fragments lodged in the nerves. The doctors called it a recoverable injury, but during those low and painful moments, Griffin had his doubts. "I wanted to turn over and move," recalls Griffin, "but I couldn’t. I felt helpless. It crossed my mind that I might never walk again. I remember breaking down, I was traumatized by the realization of how would I function and what my life would be like following the accident. Hearing a positive message and believing in it (and yourself) are two completely different things." Two surgeries were followed by an intensive regimen of physical therapy that was emotionally and physically draining. Rayford remembers, "Within 24 hours after surgery I was in a bed that was raised to a 90-degree angle to position me to sit up fully. I was fitted for a back brace and I was hoisted up to standing position. It took three fittings to get the brace to fit right." One, perhaps two weeks later, Rayford was moved to a physical rehabilitation facility, and once there the Physical Therapy intensified. "I learned how to roll over to get in the brace unassisted. The goal at Physical Therapy (often called PT) was to learn how to become self-sufficient…I needed that! I learned how to get in and out of my wheelchair, and roll myself down the hall for Physical Therapy." Rayford says his biggest breakthrough was the day he used a walker in therapy for the first time. "I took my first few steps with a walker and the aid of a Physical Therapist holding a support rope. I walked 30 feet – that was the goal – but it was really hard! First time I stood, I cried because of the pain and the difficulty of something as simple as standing. Physical therapy was very intensive; to avoid any distractions no family members were allowed. My mom phoned every day and my fiancée, Sylvia, was there after every therapy session. The physical demands of being a drummer may well have aided his recovery. "My doctor said I have welldevelopedback muscles, and the tissue is more dense than most people," Rayford explains. "Because I’m a drummer, I need to stay in great shape. I don’t have to stay in the gym; in order to stay in shape. The "stepped up" therapy process was so intense that Rayford was able to go home to California after two weeks. "I had to use a wheel chair at the airport, and initially at home when I first arrived, and continued to use it when necessary." After arriving home, he continued physical rehabilitation therapy at a facility in Northridge for severalmore months. "I was glad to be home, but still discouraged somewhat. Would I ever be myself again?" His fiancée, Sylvia (they married in 2000), stayed by his side. Bass player Stanley Clarke was one of the first to call, and one of the first to make him laugh by repeating the rumor that Griffin had fallen from a twenty-story building and was saved only by landing on his hard head. "Stanley was very concerned about my recovery. He told me I’d helped so many people; he said ‘we need you back’ and wanted to know what he could do to help," Rayford recalls. "The word spread pretty fast through the musician community," he remembers. Tom Borton a writer/saxophone player who lived down the street would cook a meal once a week for Griffin and Sylvia. Bolstered by the encouragement, love and support of a few close friends and family, Rayford planned his physical and musical comeback. A month after surgery, he began ‘playing’ on a practice pad while in bed. Painkillers dulled his senses, and maybe his dexterity, but the sound was not as important as taking that first step toward regaining his life. A few months later, real practice began, but he was still using a cane and wearing a back brace for support. His wife reports that when he was still on heavy pain killers, in his sleep his hands would be constantly moving, as if he were at a gig,performing. After a trying year that included reconstructive surgery, painful recuperation, and exhaustive physical therapy, Rayford was faced with many difficult decisions. Unable to fully use his right leg, and faced with daunting problems and pain, Rayford focused his energy on the performance stage. With the aid of a back brace and a special seat fitted to accompany his drum set, to avoid complications or possible irreversible damage to his spine, Griffin began to practice in earnest. "I started initially with one hour a day, at least a few times a week. There was no rhyme or reason behind the schedule; I just did what felt good. When I felt better in the weeks ahead, I played more." Soon he was on a mission, determined to complete the recording project abandoned the prior year. It was also time to wield his sticks in public. His first live performance was not planned. Stanley Clarke wanted to help out, so he put together a benefit at the Musicians Institute in Hollywood. At the benefit, my good friend Sekou Bunch, bass player and the MC for the evening, asked if I wanted to play. In the back of my mind I really didn’t want people to count me out, so I played one song with the band. We played a Miles Davis tune, if I remember. I was very apprehensive and nervous about the reaction of the musicians and the audience. I knew I could play, but they didn’t." Rayford had insurance, but he had been out of work for more than six months already and insurance doesn’t cover everything. "How was I going to pay the mortgage and other bills that didn’t stop coming, just because I was laid up," was one of the pressing questions on Rayford’s mind before the benefit. The event raised $ 3000 with 250 people attending. Longtime childhood friend Kenneth "Babyface" Edmonds, who also attended, contributed double that amount, giving Rayford a total of $ 9000 to help with expenses. Even after the benefit, calls for gigs were non-existent. During his recovery, Rayford began a management relationship. "My manager, Myron Bernard, urged me to finish my CD and to consider doing some shows. Some people thought I couldn’t do it, thought I’d never perform again." So a few months later he did his own show at the Baked Potato in Hollywood, "to prove to them (and myself) that they were wrong!" Since then, there has been no turning back. Moving forward with his project was a healing process in itself. "With encouragement of my family and management, I was getting a new beginning in life. A rebirth, if might say. I started my own my record label, RazorEdge Records. This year, we signed with Lightyear Entertainment, which is distributed by WEA, and my CD is in the stores." Life has changed for Rayford. "Now I’m married, have two kids. Walking and being able to pick up the kids is a very big deal for me…it didn’t have to turn out this way, but thankfully I’ve recovered." "I’ve come to realize how very important PT is to one’s recovery after an injury like mine and would like to find a way to give back to an organization and share my experience with others; basically to show my appreciation." Rayford’s ambitious plan – "to make a record with music from the heart that the whole world would embrace" – is back on track. He is, once again, in such demand that the offers to play with groups, other than his own, are too musically tempting to turn down. And now he’s determined to do it all. Plans for his own second CD are in the works, and while management works on a tour for his own group, Rayford can be seen performing with BWB (Rick Braun, Kirk Whalum and Norman Brown), Rick Braun, Jeff Lorber and James Ingram.